Today, folks in Wheaton attempted to break the world’s record for number of kites in the air at once. Of course I had to be a part of that! So with my cousin TJ, friends Gemma and Lana, and my beloved miniature dachshund Joyful, I headed over to Graf Park for the festivities. Gemma gave me a bright colored kite with two butterflies, a grasshopper, and a bumblebee on it, and soon my friends and I had our kites in the air. My kite line got “cut” (just like in the movie “The Kite Runner”! ), but I didn’t mind. I picked up the kite frame and the long line still attached to it got tangled around my body when the wind took the kite suddenly back up into the air! I felt like I was dancing with my kite! Kite-dancing! It was so fun! The sun was so bright, the blue sky so clear, and the wind so magnificent. I was remembering sitting on the rooftop of a friend’s apartment building in the Abu Tur neighborhood of west Jerusalem, looking out of the valley toward the Church of the Dormition on Mt. Zion, as I watched Arabic boys fly their black diamond kite over the valley at sunset. Later, Gemma repaired my kite by tying the kite line still attached to the frame to the kite line attached to my reel, so that was good. 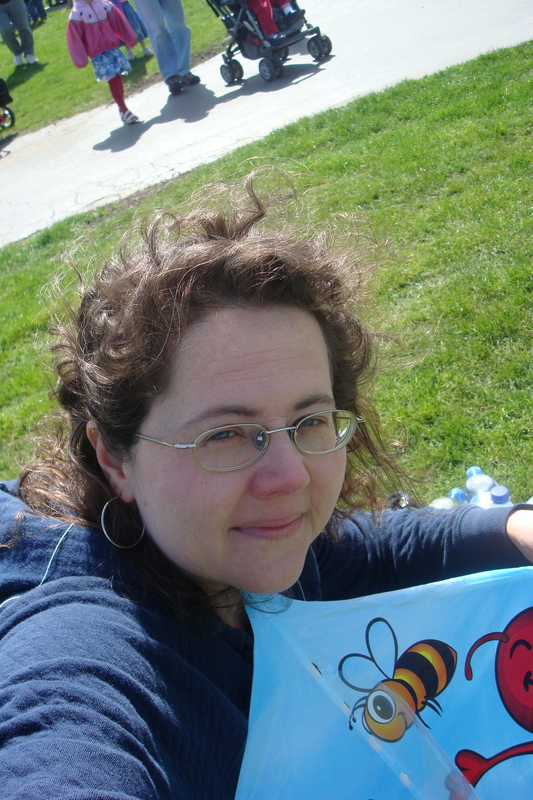 She and TJ also rescued Lana’s kite from a tree–with the help of a professional park district sort of person. And then we watched the kite ballets! People actually fly kites professionally, making their kites dance in air in rhythm to music, and the first we saw was a true ballet. The next, flown by Zach Gordon, was really kite break-dancing in air! I thought it was awesome. 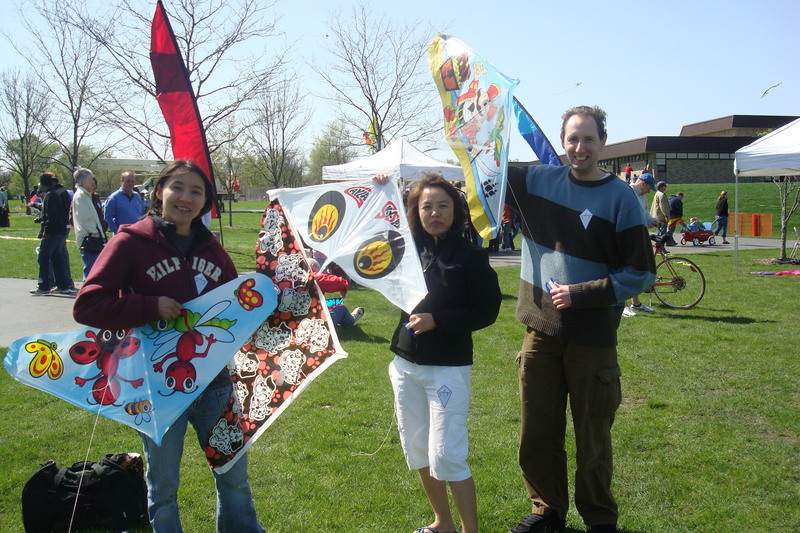 Then the Chicago Fire Kite Team flew their four “killer bee” kites in the air for three different choreographed sets, and their coordination was admirable, too. The whole thing was so cool! So naturally I have to honor this kite-dancing day with a poem. Here it is! When we came home, Gemma told me how she used to make kites in the Philippines. She would make the kite body out of newspaper and attach it to the spine of a palm tree branch with rice paste. Then she and her brother would take it up on the roof and fly it! 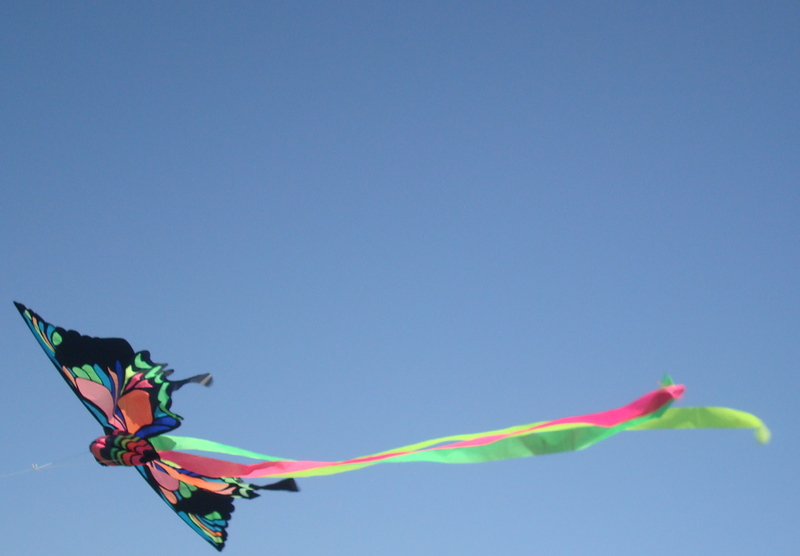 If you want to make your own kite, check out: Make Your Own Kite! … and enjoy. Last night, I joined the Brotherhood of the Briar at the home of my friend, Dr. Jerry Root. The brotherhood meets outside on dark Thursday nights around a splendid fire to drink scotch, smoke pipes, and talk poetry — very much in the spirit of Inklings like J.R.R. Tolkien and C.S. Lewis. I snuck in to celebrate National Poetry Month with them … with taquitos, a story, and some poetry about eagles. One of the brothers, Justice, read two poems very beautifully: Whitman’s “O Captain, my Captain” and Poe’s “The Raven.” Since we’d had a poem about a bird already, it followed naturally for me to share my story about a world-breaking flight. Jennifer Murray, 66, and Colin Bodhill, 55, recently became the first woman and man to circumnavigate the globe from north to south in a helicopter, but only by facing incredible challenges first. When they were flying over the Antarctic, they hit a storm or rather, a storm hit them. They were flying blind. The landscape was completely whited-out around them. And they crashed. With a broken back, in minus 40F weather and 35 MPH winds, Colin got up, dragged Jennifer out of the helicopter into a sleeping bag, erected an emergency tent, pulled a generator from the crash, and lit a stove. Because of this, both Colin and Jennifer survived to be found 4.5 hours later by a search-and-rescue team. Colin has said that if he had been alone, he would have given up and died because he knew his back was broken and he could feel the internal bleeding. But because of the threat to his co-pilot’s life, he got up, and he did the impossible. After this, both Jennifer and Colin had to recover from their injuries. They did. Then, they got back in their helicopter and flew around the world together, just has they planned, this time without crashing. They set the world-record and became the first man and woman to circumnavigate the globe in a helicopter. (An interesting note: Jennifer had already gone around the world in a helicopter by herself and set the world-record for doing so as a woman in solo flight!). In honor of these two daring heroes (whom Jerry Root affectionately called “crazy!”), I read a paragraph about eagles found in the 14th century Petersborough chronicle, “The Eagle” by Alfred Lord Tennyson, and “The Dalliance of Eagles” by Walt Whitman. Many other things were said and done (and I shall certainly remember Greg Root and Mark Neal putting splinted wood on the fire as the flames leaped around their forearms!! ), and I enjoyed the whole poetic evening very much. I hope you, too, are enjoying National Poetry Month. p.s. To read Shelby Skrhak’s original write-up of Jennifer and Colin’s record-breaking adventure and see pictures, visit the essay that appeared recently in Success magazine. What do lovers, poets, Christians, and fools all have in common? The 1st of April, of course! Yesterday started off National Poetry Month delightfully for everyone (as far as I can tell). Afterwards, I learned that my mother (who is probably my biggest fan – love you, Mommy!) was able to listen to the interview live on the internet in California while Facebook-chatting with a friend in Jordan (yes, the Middle East, right across the river from Israel) whom she persuaded to listen to “Joy in the Morning” online, too! You never know how far your voice can reach. In April, I’ll be writing a poem-a-day (as I did last year), and I invite all other poets out there reading posts at “The Poetry Place” to do the same. If you aren’t writing, I hope you’re reading poetry. Poetry can bring you joy! And I am wishing you all joy during National Poetry Month.